Update #3 - June 23, 2005 - Done! 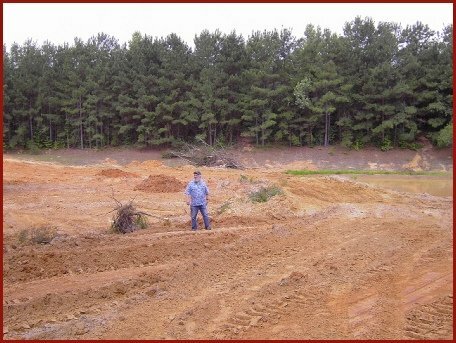 Dad & I hired Harmon Mansell (see the below "background" section) to try to seal Brushyland's pond by using clay found near the pond site and a special clay that Harmon brought in called Sodium Bentonite. He used approximately 72 tons of Bentonite. That's two 18-wheeler flatbeds of Bentonite. 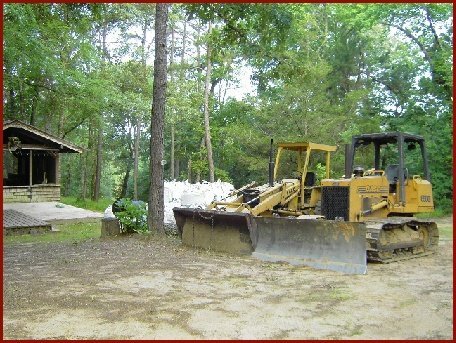 Above are Harmon's dozer and backhoe. In the background are just a few of the large bags of Sodium Bentonite that Harmon will spread into the pond site. 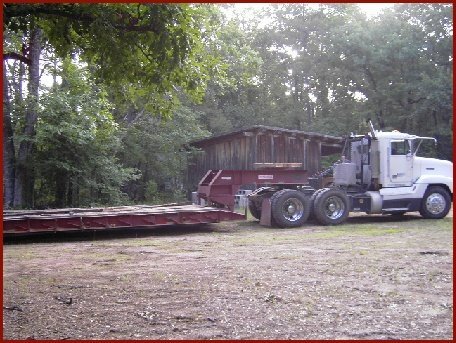 This is the large flatbed trailer used to transport the dozer and backhoe. Other flatbeds were used to transport the 72 tons of Sodium Bentonite clay. 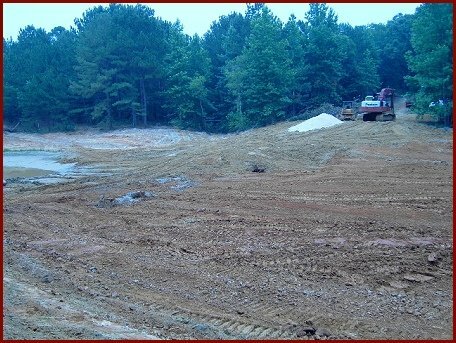 Harmon is in the process of "bowling out" the pond site. After he's done bowling out the pond, he'll put down a layer of locally-found clay and then a layer of Sodium Bentonite and then more local clay on top of the Bentonite. He likes to sandwich the Bentonite between two layers of local clay. And at the very end he'll probably sprinkle some more Bentonite on top. If there are still leaks, hopefully the Bentonite on top will be pulled into the leak and stop it up. Dad inspecting the progress after just two days of work. If the pond gets a good seal, the water should be head-deep where dad is standing. Potentially bad news. After a couple days of work, Harmon discovered that there is a high water table under the entire pond site. He thinks that our main little "scoop" that always holds water could have broken through to the water table - which would explain why it always has some water in it, even in a drought. If this is the case, then when rain partially fills the pond, the water pressure could force the water into the water table and away from our lake. Not good. But, as you'll see in the below Update #2 Harmon will come to believe that the main scoop has enough clay in the bottom to seal it from the high water table. But to be safe Harmon still wants to put more of our natural clay and more of his Sodium Bentonite clay (a total of 72 tons of Bentonite instead of 48 tons) in the entire pond site to protect it from the high water table. Thus, this project went from a one week, $15,000 effort to a two week, $24,000 project. Ouch. But believe it or not, that's still over ten grand less than what another pond sealing company wanted to charge us. And they weren't even going to use dozers or extra clay from our land - they were just going to spread the Bentonite and hope for the best. 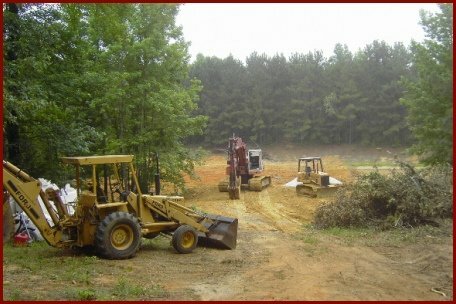 Harmon is going to pump the existing water out of the pond so that he can work most (if not all) of that area with his dozer. This will, of course, kill all the fish in the pond. I felt sorry for the fish, so I caught a few bass using a spinnerbait and transported them to nearby Lake Palestine in a trash can of pond water. LOL. I tried using stink-bait to catch some catfish but I couldn't get them to bite. Harmon brought out the big gun since my last update. That backhoe (or "trackhoe" as he calls it) in the middle of the picture might not look all that big, but it is considerably bigger than the other two pieces of equipment. He uses it to dig up clay to line the pond site with and to dig small test holes to look for problems in the pond site (e.g. leaky sand, gravel, etc.). Harmon has pumped nearly all the water from our pond. 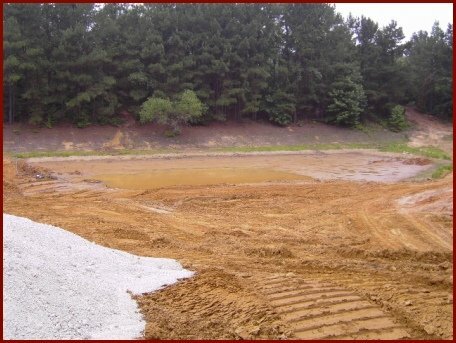 That white stuff in the foreground is a small pile of Sodium Bentonite clay that Harmon will work into the pond site. 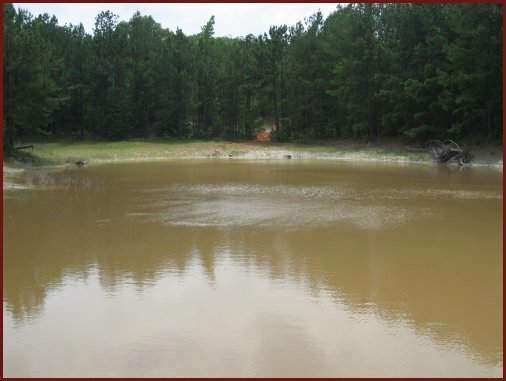 Sodium Bentonite swells 10 to 15 times in volume when wet - so it's ideal to help seal leaky ponds. That pile is only a small portion of the total amount of Bentonite we'll have to use. View from the dam. The area in the foreground is what we call our "second scoop" and is where we would ride our dirtbikes on a makeshift track. Potentially good news. Harmon still thinks that we have a high water table under the pond area but he no longer thinks that the "scoop" that has always held water has broken through to the water table. If that scoop had indeed broken down to the water table then anytime rain partially fills the lake, the water pressure would cause the pond water to go into the water table and away from the pond. Fixing that problem would have been very tough. But Harmon got a sample from the bottom of that scoop (which still had a foot of water on it) via his trackhoe and discovered that it was good clay - and that the clay was dry just a few inches from the top. So Harmon thinks this scoop has alway held water simply because it has a very good clay liner. Potentially more good news. 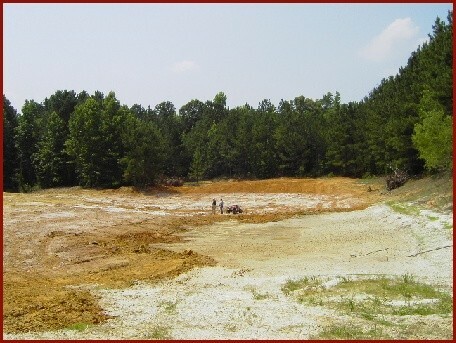 Harmon often uses his trackhoe to dig test holes in many places when a pond is known to not hold water. While doing this, he discovered some "river gravel" near our main scoop of water. That gravel is from the old creek bed that ran through the pond site before the previous owners built the dam. That type of gravel is notorious for carrying away water. He feels very sure that this is the main reason why our pond wouldn't hold water. He has already packed over a foot of clay on top of the gravel and will put lots of Sodium Bentonite on top of that. Harmon sounds very confident that this pond will now hold water. We shall see. Fair news. 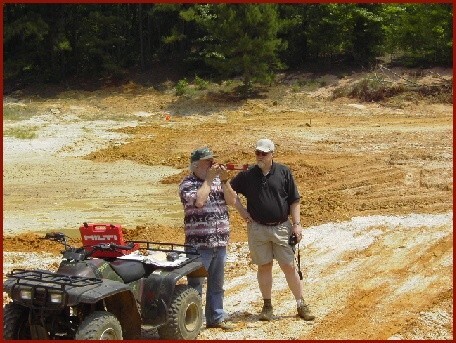 After digging a few test holes, Harmon noticed that some of the areas where we have sand (like on the slope leading towards The Compound) actually has clay under it. That's good news. But he thinks that the southern feeder channel leading into the lake (i.e. the cut that we normally pump water from to work the potty) contains very leaky sand with no clay under the sand. So he thinks the pond will leak in that area. That cut always seems to have some water in it, so it might actually be able to hold water. But Harmon built a small clay damn on the pond side of that channel so that our pond won't completely drain if that channel can't hold water. Update #3 - June 23, 2005 - Done!! This picture was taken just one day before completion. 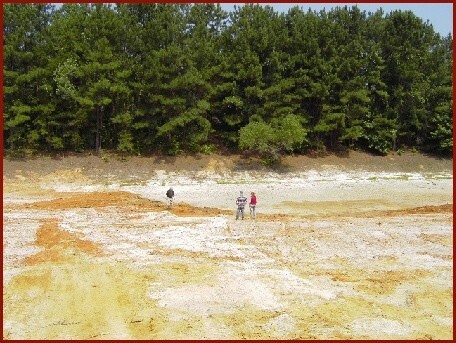 In most areas of the pond site Harmon laid down a layer of locally found clay (orange in color), then a layer of Sodium Bentonite (white in color), and then another layer of locally found clay. 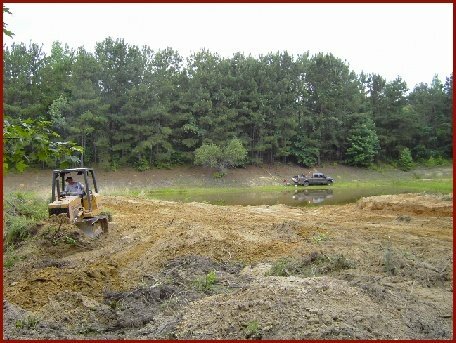 Unfortunately he did not work his dozers in the deepest part of our pond (right hand portion of the picture) because it was still very wet there. 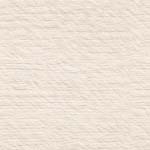 Harmon is sure, though, that this area contains very good natural clay. But just in case he spread a lot of Bentonite in that area. This picture was taken two days after Harmon had completed his work. Harmon finished his work in our pond site by spreading some Sodium Bentonite (the white stuff) on top of natural clay (orange) which itself was placed on top of a layer of Sodium Bentonite. 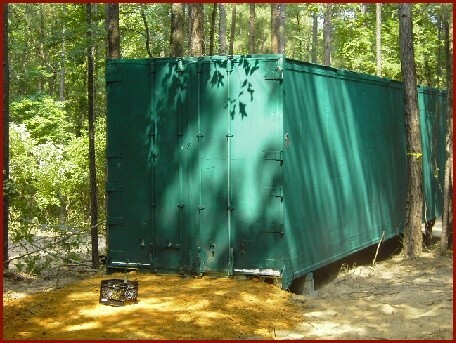 Dad paid Harmon to haul in a 48 foot long 18-wheeler cargo container, paint it green and place it in the woods where it will be fairly hidden. Dad is showing Stan how dad & I marked where the shoreline would be if the pond ends up holding one surface acre of water. It's possible for the pond to hold more than that. And, of course, it's possible for it to hold much less. View from the north end of the pond. The dam is on the right. Harmon is nervous that the southern feeder channel can't hold water, so he built a small dam in front of it. If the water makes it to the top of that dam, the lake will be one roughly one acre. 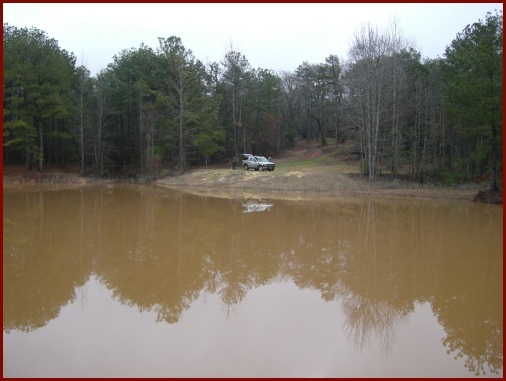 If the water makes it over that dam and the feeder channel holds water, then the pond could become two or more acres. As luck would have it, we have received very little rain since the sealing efforts were completed seven months ago in June 2005. In fact, the entire North Texas area is in the middle of a severe drought - with wildfires popping up all over the place. Still, Brushyland received two rains in late January that totaled roughly three inches. We got enough run-off to put several inches of water in the pond site. The pond probably has a foot and a half of water in it now. It's still just a mud hole, but perhaps we have enough water in it to tell if it will hold or not. We'll definitely be keeping an eye on the water level. The interesting thing is that the rain also put a little water in the southern feeder creek (the one we used to pump water from to fill the potty tank). But that water disappeared after only a few days. After using his backhoe to dig test holes seven months ago, Harmon felt that this channel would not hold water - so he built a small dam between it and the main pond site. But this channel has always held water in the past, so either Harmon accidentally did something to cause it to leak or perhaps the sand soaked up the water and it will eventually begin to hold water like it used to. As of this writing (January 2007), it's been 18 months since the pond sealing effort ended - and Brushyland is just now finally getting some decent rain. It has been a terrible two-year drought. The pond now has 8 feet of water in the deepest part. 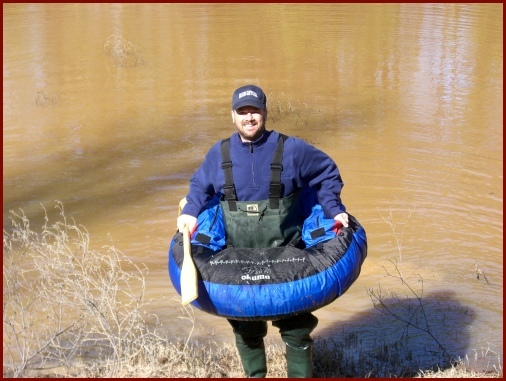 I used that float tube to install a homemade water gauge into the pond. Unfortunately, it appears that the water level is dropping, but we need to watch it over time to verify that water is indeed still seeping out. Note: through various measurments we now know that if the water ever gets to the top of the rail on the wooden bridge, the deepest part of the lake would be 15' 2" deep. Since the January rains, the lake has been leaking at a rate of 3 to 4 vertical inches each week! As of this writing, the pond has dropped to 5' 1" at it's deepest part. Rain temporarily puts some water back into the lake, but then it seeps out at 3 to 4 inches per week. So it appears that the sealing did NOT work. Before Harmon did his work with the bentonite, the pond would lose one vertical foot per week due to seepage, so things have improved but it's still leaking way too much. We may talk to Harmon about this and see if it's worth paying him to spread more Sodium Bentonite clay onto the water surface, with the hope that the bentonite will sink to the bottom and be drawn into the leaky areas. More Sodium Bentonite! It has been two years since Harmon tried to seal our pond by working 72 tons of Sodium Bentonite clay into our pond's bottom. But the pond still leaks about 4 vertical inches each week. So we hired Harmon to come back to Brushyland to throw 24 more tons of Sodium Bentonite clay onto the water's surface in the hope that the Bentonite will sink to the bottom and stop most of the leaks. We'll see. Here are some more pictures from this effort. When dad bought Brushyland back in 1978, a dam had just been completed - but the pond had not yet filled with water. 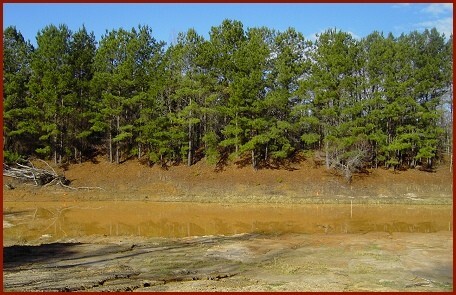 The seller was trying to increase the price of the land with the hope of a 5 acre pond in the future. Dad didn't fully trust that the pond would hold water so he put in the contract that if the pond didn't fill up after two years then he had the option to sell the land back to the seller. 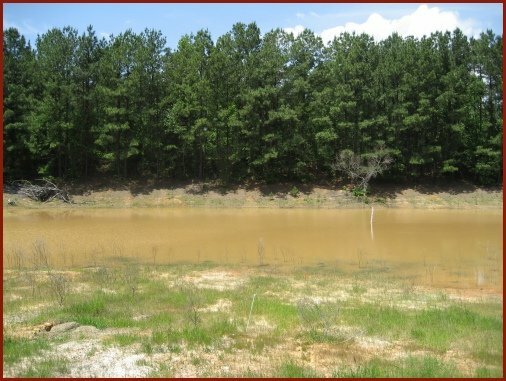 During the first year, the pond (which dad nicknamed Two Moons Lake) held some water - maybe even as much as half an acre. But soon, it was just a mud hole. But after two years we had invested so much love and energy into the land that we couldn't sell the land back. Seven years later, in 1985, we thought that the pond site might actually be able to hold water but that perhaps there wasn't enough rain run-off going into the pond. So we had a 5-ft long electric water pump sunk several hundred feet and ran PVC pipe to the pond site. After several weeks of pumping water into the pond, there was a noticeable improvement. Soon, the pond was nearly full. It was beautiful - here is a page with some pictures and a video clip. We stocked it with fish and had a ball catching largemouth bass, catfish and brim. But after a year or so the pond began losing water. Soon it was back to it's puny size. Most of the fish died - their skeletons littered the growing shoreline. It was heartbreaking. Dad met with a guy from the Soil Conservation Department who said that there is a ring of leaky sand at the pond site. So fixing it seemed insurmountable. But twenty years later, in 2005, I found a guy named Harmon Mansell via an internet Google search who seals ponds using a type of clay called Sodium Bentonite. 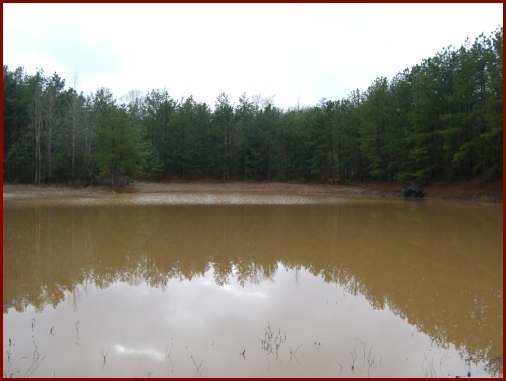 Sodium Bentonite expands 10 to 15 times it's size when wet, so it is ideal for sealing ponds. And since it is a natural product it is not harmful to fish or humans. 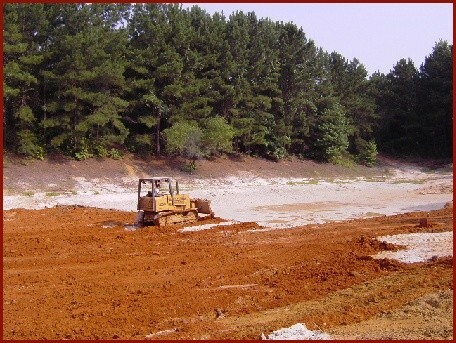 In June 2005, Harmon spent several days (over a two week period) trying to seal Brushyland's pond by working 72 tons of Sodium Bentonite clay into the pond's bottom. In most areas of the pond he laid down several inches of locally found clay and then a layer of Sodium Bentonite and then another layer of locally found clay. Unfortunately, two years after this work the pond was still leaking about a foot per month (it had been leaking a foot per week), so we hired Harmon to come back out in June 2007 to throw 24 more tons of Sodium Bentonite clay onto the water's surface in the hope that it will sink to the bottom and seal up the remaining leaks. Click here to see more about this effort.